HÀ NỘI — A running race around Hồ Gươm (Sword Lake) will kick off the 6th Mottainai Festival on the morning of October 13 with the participation of representatives from the Việt Nam Women’s Association and Japanese embassy in Hà Nội. The one-day festival, with the theme ‘Give Love – Receive Happiness’, includes a wide range of cultural, artistic and sporting activities. The festival ambassadors are Vietnamese celebrities including actors Mạnh Trường and Bình Minh, actress Diễm My, and Miss Photo 2017 Vũ Hương Giang, who will all contribute to raising awareness of traffic safety and to provide support to child victims of traffic accidents. Special ambassador is four-year old Nguyễn Quốc Huy, who was was ripped from his mother’s womb in a crash in the southern province of An Giang. His mother was killed and his right leg was cut off. 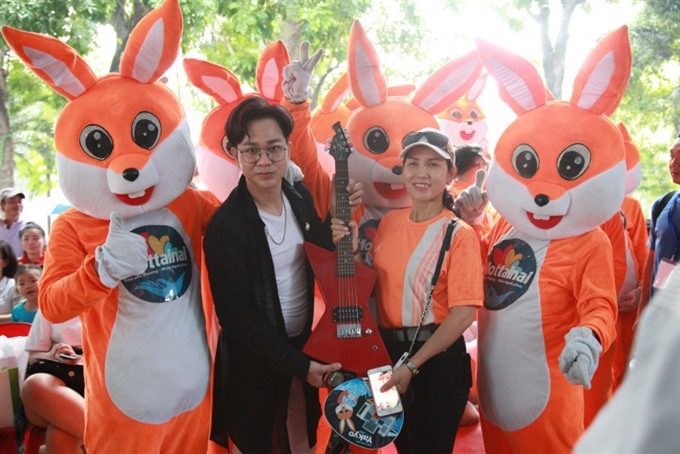 Festival-goers can partake in the one-lap ‘Happy Run’ or three-lap ‘Challenge Run’ around Hồ Gươm to raise funds for child victims of traffic accidents. Stalls will also be set up selling second-hand items for charity. Mottainai is a Japanese word that means ‘pity for something to be wasted’. Japanese artist Kazuma Takahashi has attended the Mottainai Festival for three consecutive years. He is the chairman of the Japan Package-Craft Association. He will teach festival-goers how to use empty packaging from commercial products to make a variety of novel items shaped like robots, vehicles and animals. Martial arts clubs and college students will perform at the festival and a fashion show will feature traditional Vietnamese and Japanese costumes – kimono and áo dài – in the early afternoon. Representatives from Japanese organisations such as the Japan International Cooperation Agency (JICA), Toyota and More Production will host talks to introduce the concept of Mottainai and promote traffic safety. Two auctions will be held at 11am and 4pm to raise funds for charity. The highlight of the festival will be a concert by Vietnamese and Japanese artists which will be held at 4.15pm. Japanese cosplay and Vietnamese folk games will be held throughout the day. The festival will also present gifts and scholarships worth up to VNĐ300 million (roughly US$13,000) to over 300 orphans from many provinces and cities.